We welcome guests to our luxurious home to enjoy our four inviting bedrooms, (3 queen beds and 1 king in master suite), all with TV and WiFi. The fully equipped kitchen has everything you need to enjoy simple meals or entertain. We also have laundry facilities. 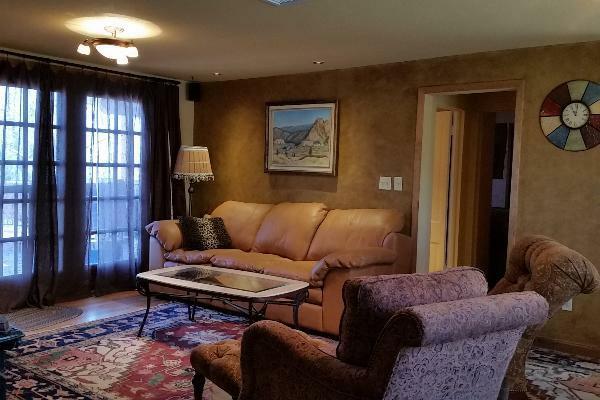 The cozy living room with wood stove offers a big screen satellite TV with a DVR loaded with lots of movies and shows. The large back deck has a hot tub, ample seating, privacy gates and amazing views of wooded meadows and creeks. The front yard has lots of flowers and green grass to enjoy. Buena Vista, located near Continental Divide at 8000 feet, has something for everyone. This area is not only the white water capital of the world, but it has plenty of open space for Jeeping, ATVing, horseback riding, hiking, cycling, fishing, zip-lining and rock climbing. Buena Vista is a friendly town that has community activities daily: music concerts, festivals, rock shows, rodeos, parades and amazing town parks and shopping. Colorado has 53 Fourteeners (mountains over 14,000 ft), of which 28 are here in Chaffee County. We also have amazing parks, forests, lakes, rivers and attractions surrounding our town. Check in time is 4 PM and check out time is 11 AM. Minimum nightly stay is two nights. Deposits are required for all reservations in addition to lodging rates. The total deposit of $1000.00 is payable in full at least 30 days before arrival. Cancellations and refunds will considered prior to 30 days before arrival. Deposit will be held for reservation, cleaning or damage until property has been inspected after check out time. This "cleaning/damage fee" will be held only if the property has unusual or excessive cleaning requirements or damage. Deposits will be returned within 5 business days.